President Moon had summits with Singaporean President Halimah Yacob and Prime Minister Lee Hsien Loong respectively on July 11 and exchanged opinions on subsequent negotiations of the North Korea–United States summit. Mr. Yacob in response said “With the SEAN member countries, Singapore will do its best to support your will and effort in creating peace in the Korean Peninsula and the world.” Moon then showed his gratitude to the Singaporean government to have given an unsparing support both materially and morally for the historic summit. 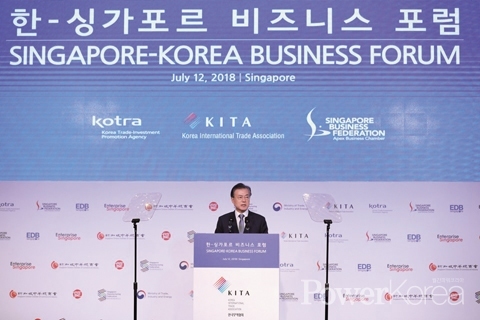 Moon attended the Korea-Singapore Business Forum held on July 12 and gave a keynote address under the title ‘Challenge for Peace, Cooperation and New Future’. Total of 81 companies big and small and 150 government and industry officials attended the forum on the day. Singapore is the second largest trade partner of Korea among the ASEAN and the 10th largest in the world. 800 Korean companies are operating in Singapore and 1,500 Koreans have secured a job in Singapore for the last three years. Singapore is known to have strength in city state strategies, startup promotion and cutting edge technology and platforms and is received as an ideal partner in the impending age of the 4th Industrial Revolution. Moon praised Singapore in his keynote address by pointing out Singapore’s 60,000 US dollar per capita income, 80% high employment rate, global logistics hub, global level markets for finance and crude oil, and the safest and the cleanest country in the world. “Korea and Singapore have grown to be good partners of economy, security and culture and become better friends than ever before after the historic summit. More opportunities for economic cooperation will take place if the denuclearization of the Korean Peninsula sees its light.” He closed the speech by saying “Majulah Singapura” meaning “let us go together”. On the last day of his visit on July 13, Moon took the podium of the 42nd Singapore Lecture to deliver his message under the title ROK and ASEAN: Partners for Achieving Peace and Co-prosperity in East Asia. Moon promoted his New Southern Policy and his vision of peace and prosperity during his 20 minute lecture. Hosted by the ISEAS (Institute of Southeast Asian Studies), Singapore Lecture is recognized as a worldwide authority on lecture programs. Total of 41 renowned speakers have taken the stage starting by the Nobel laureate in Economic Sciences professor Milton Friedman of University of Chicago in October 1980. Former President Kim Dae-jung also shared the stage in November 2000. 400 audiences attended the Moon’s lecture this year showing great interest in the recent summit.